The Bombard Commando C-5 is one of our all time favorite boats of any type and remains unchanged. Some things you just can't improve on and the Bombard Commando line is the one we turn to for most of our personal boat needs. We use them in the NW for just about any activity on the water including rescue. Often used by various fisheries due to it's ability to carry tremendous cargo loads on plane in very shallow waters. 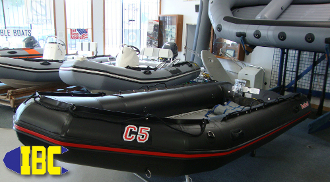 In the marine environment this boat is unparralled and serves as the seed for all modern inflatable boat designs in use today. A favorite for jetdrive conversion, fishing guides, dive charters, or heavy users.